Because of depressed Canadian oil prices, Crew Energy generated a total negative netback during Q4. The company operates at high costs and its net debt is high compared to some of its peers. The company needs higher oil and gas prices to realize the value of its important reserves. The market doesn't value the company at a discount. Crew Energy (OTCPK:CWEGF) generated a total negative netback during Q4. Compared to some similar Canadian producers, the company operates at higher costs and its leverage is high. Based on the midpoint of the estimated 2019 production, the 2P reserves represent 50 years of production. But the company needs higher oil and gas prices to realize the value of its important assets. In this context, the market doesn't value the company at a discount compared to some similar producers. Before getting into the valuation, let's have a look at the Q4 results. During Q4, production dropped 11.4%. 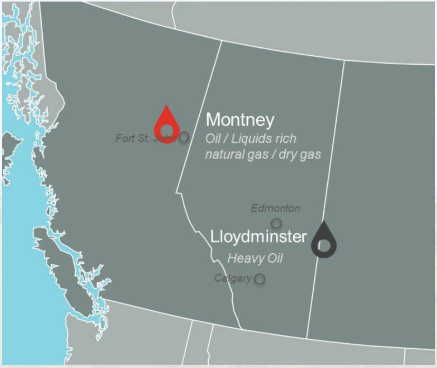 Management curtailed 1,340 boe/d of non-Montney natural gas and heavy oil production to preserve the value of the reserves in the context of depressed Canadian oil prices. Without this decision, production would have decreased by 6.1%. The full-year production still increased by 3.6%, though. The table below shows the lower realized oil prices during Q4 compared to last year. The company realized better gas prices thanks to its market diversification to the U.S. hubs. Gas prices in the U.S. were higher during Q4 due to early winter cold weather in the gas-consuming regions. And, as shown in the graph below, U.S. hubs will represent an increasing part of gas sales during 2019. With higher gas prices and lower liquids prices, the company realized equivalent total prices compared to the previous quarter. The table below shows the costs stayed stable QoQ. Compared to some other similar producers, the company still operated at higher costs. 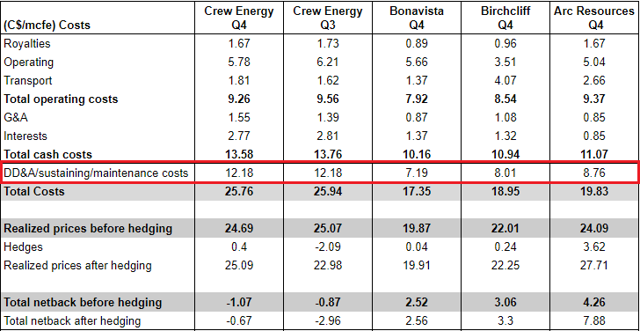 The most important component of Crew Energy's higher costs is the sustaining capex. The company announced a 2019 capital program of C$95 million to C$105 million to hold the production flat. Taking into account the midpoint of the guidance, the per-unit sustaining capex is C$100 million / (22,500 boe/d * 365) = C$12.18/boe. In contrast, the sustaining costs of the other producers are much lower, in the range of C$7.19/boe to C$8.76/boe. 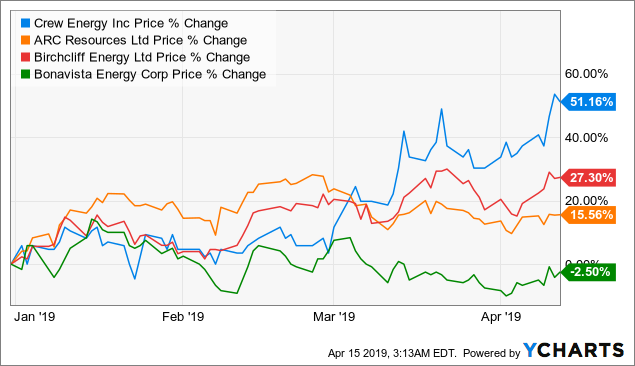 Despite the similarities, the comparison with Bonavista Energy (OTCPK:BNPUF), Birchcliff Energy (OTCPK:BIREF), and ARC Resources (OTCPK:AETUF) isn't perfect. The production mixes aren't identical. But the point is to highlight the higher total costs and lower netbacks Crew Energy generates compared to these producers. 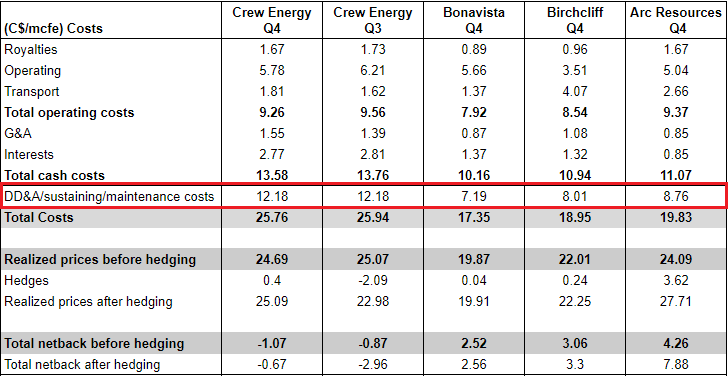 During Q4, Crew Energy generated a negative total netback while the three other producers operated at a profit. Also, the net debt, which decreased by only 1% year over year, is high. The net debt to TTM adjusted funds flow ratio is 3.73x. It's the highest debt ratio compared to the three other producers. Thus, amongst this group of producers, Crew Energy operates at the highest costs with the highest net debt ratio. Crew Energy's reserves explain a part of this difference. The table below compares the Reserves Life Indexes based on the midpoint of the estimated 2019 productions. Crew Energy's 2P reserves represent 50 years of production, which is much higher than the three other producers. Owning such important resources has a cost. For instance, during Q4, Crew Energy had to spend resources and drill a well to keep its land in the Attachie area. Also, the reserves report indicates a net present value of C$2.4 billion for the 2P reserves. But the estimation is based on optimistic oil and gas prices assumptions, as shown below. We have seen that, at Q3 and Q4 oil and gas prices, the company didn't generate a profit. Thus, an important part of the value of the company depends on higher oil and gas prices to realize the potential of its important 2P reserves. In this context, how is the market pricing the company? Since the beginning of the year, Crew Energy's stock price, now at C$1.3, increased by 51.16%. The market values Crew Energy's flowing barrel at a premium compared to Bonavista Energy and Birchcliff Energy. Considering the lower netbacks Crew Energy realizes, the premium is surprising. Also, the valuation of the reserves shows the market discounts the 2P reserves. But there's no discount to Bonavista's and Birchcliff's PDP and proved reserves. The market values Crew Energy at a discount compared to ARC Resources. But ARC Resources generates the highest netbacks, thanks to its scale. And ARC Resources' net debt ratios are much lower. From the intrinsic valuation perspective, the stock price of C$1.3 corresponds to a profit of C$2/boe. 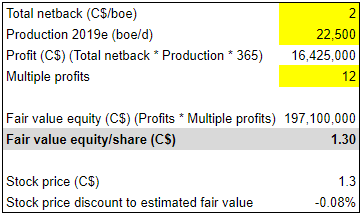 The valuation assumes a 12x multiple to the profit of C$2/boe while holding production flat. Management guided on stable costs compared to the last two quarters. Thus, the company needs higher oil and gas prices than during Q3 and Q4 to justify the current valuation. Despite higher costs, lower netbacks, and more leverage, the market doesn't value Crew Energy at a discount compared to some other similar producers. The company needs higher oil and gas prices compared to H2 2018 to realize the value of its important reserves via asset sales or higher netbacks. During Q4, Crew Energy generated a total negative netback. The depressed Canadian oil prices offset the benefits of the diversification to the U.S. gas markets. The company owns important reserves, but it operates at high costs and the net debt is high. Thus, the company needs the oil and gas prices to improve to realize the value of its assets. The market doesn't value the company at a discount compared to some of its peers. Thus, considering the need for higher oil and gas prices to justify the current valuation, I prefer not to invest in the company.